Scarlet and Red dream of going to see the Scarlet Ibis in the Caroni Swamp in Trinidad. Scarlet looks after her younger autistic half-brother Red because her mother is not well. Together they are following the progress of a pigeon chick in a nest on the windowsill of their tower block flat. Scarlet thinks that things are going OK, but then disaster strikes. Her mother has a breakdown and there is a fire. Scarlet and Red are split up and sent into foster care. Before she goes, Scarlet finds the baby pigeon and takes it with her. She hopes to keep the baby pigeon alive for Red. Scarlet's foster family are kind, but she misses Red, and decides that she must find him. Will Scarlet and Red be reunited, and will they ever achieve their dream of visiting the Caroni Swamp? Previously Gill Lewis has set her stories (Sky Hawk, White Dolphin, Moon Bear) in a natural context. However, this time she has focused on an urban environment, using wild birds in the city as the backdrop for a contemporary story about a fractured family. Her writing displays great social awareness as well as great emotional intelligence. 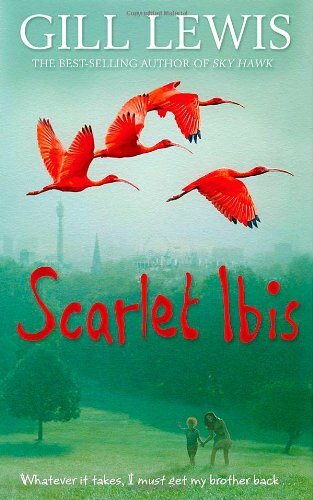 Scarlet Ibis is a very good read. It is engaging and insightful without creating an exaggerated sense of pathos.